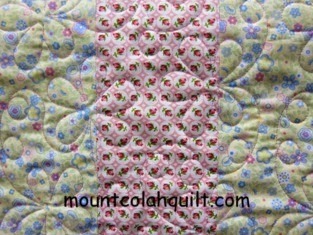 My friend, Michelle, has decided that machine sewing isn't her thing but she loves hand sewing. I, on the other hand, will take any opportunity to avoid hand sewing.! 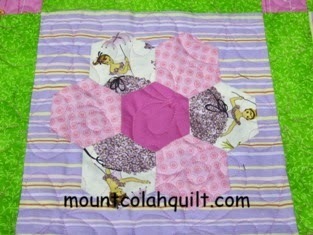 Michelle has made all these lovely hexagon flowers from scraps. I was glad to help when she asked if I could put all the blocks together. During the process, we discussed and consulted each other about the fussy cutting, colour scheme, and layout of the quilt. I, then, made up the backing from the left over fabrics Michelle already had, quilted the quilt top for her, on my wonderful Gammill Statler, of course, and with the new CS6 software, it's fantastic. 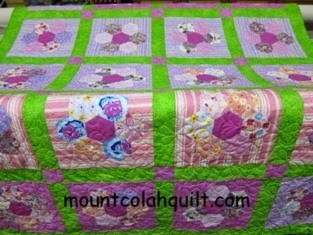 I chose the pattern named 'Daisies Galore' by Irene Steele for the quilt. 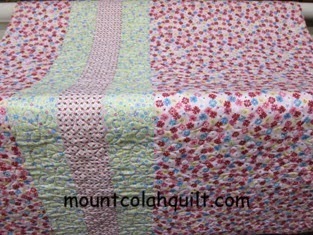 After the quilting was done, I attached the binding. It's now ready to be sewn down, by Michelle's hands, not mine. :-) She has plenty of time to finish off the binding as the quilt is going to be a birthday present for her second daughter, Caitlin, towards the end of the year.